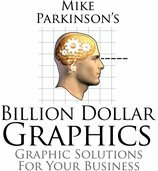 Billion Dollar Graphics: What is the difference between jpg and other types of graphics files. When should which be used? What is the difference between jpg and other types of graphics files. When should which be used? I use 200 dpi RGB (unless you are printing the files on an offset press) tifs for placement in Microsoft Word, Adobe InDesign, and Quark Xpress. It is worth noting that jpgs are acceptable in written documents if file size is an issue since jpgs are about a third of the size as tiffs and are only of a slightly lower quality. I use 200 dpi RGB jpgs for Microsoft PowerPoint. I prefer 200 dpi images because they look great in print and on screen and can be half the file size of 300 dpi images. I recommend 80% compression when saving your jpgs to avoid “pixel garbage” in your graphics. I use 300+ dpi RGB or CMYK files for professional printing like brochures, slicks, folders, etc. I do not work with bmps and pngs because of their history of volatility with certain programs. For example, pngs allow for transparency but print poorly and have been known to corrupt entire PowerPoint presentations. There are many other file types beyond those I have listed but I have found that jpgs and tifs are the most accepted, stable, and reliable for proposals. However, if you have had successful results with other file types (like metafiles—which requires article unto itself), use them. If it isn’t broken, don’t fix it.